There are so many new restaurants opening up in San Diego that it is hard to decide which one to try out first. Since I was going to meet a young man to interview in Pt. Loma, the Embargo Grill seemed like a good place to try out. The restaurant is located in the old “Longs” shopping center on the corner of West Point Loma and Midway Ave., where the Soup Plantation, the Halibut Shop, Denny’s, CVS, etc., are located. I hope that the location is not a bad omen, because the restaurant that used to be in the same location, “BGR” was one that I rated highly – at least the first time I was there. The Embargo Grill is in the same place, and unless I am mistaken, even the furnishings are the same. Jake and I were greeted by Sarahdawn almost immediately after coming into the restaurant. I had a coupon for a free sample of their Mariquitas De Platano – seasoned fried plantain chips – $1.95 and she spotted the coupon right away. She asked if we wanted to try the dish and we both answered in the affirmative. When she brought them to our table she knew that also on the coupon was sangria for 1 cent a glass. She asked if we wanted to sample that too, and when we also said yes she asked us if we wanted the red or the yellow. We elected to have one of each and share them and she said it was a good idea. A few moments later she brought us a plate of “Tostones” – double cooked green plaintains – $2.95 – and said they were complimentary because they were cooked by mistake. Shortly after the Platano was delivered, the owner, Hudi, came to our table and asked if we had decided what we wanted to order. When I asked him his name and he said “Hudi” I nearly fell over. As a principal in San Ysidro, most of my staff could not pronounce the “J” in Judi, and I was known as “Hudi.” I truly thought he was putting me on, because I had already begun my interview with Jake and my OB Rag card was visible, although up-side down. When I asked Hudi what he recommended and he said I should have the “curry” because my name was Judi Curry I was sure that his name was not Hudi. It turns out, though, that his name is “Yehuda” and is called Hudi for short. Jake had decided that he was going to have the Churrasco Steak ($9.95) which was grilled marinated Argentinian Style steak, Yellow Rice, Cuban black beans, topped with chimichurri sauce and green onions. I had Hudi order for me and he selected the “Hurricane” ($11.20) which was Sauteed Shrimp, Citrus Chjli sauce, white rice and Cuban black beans. 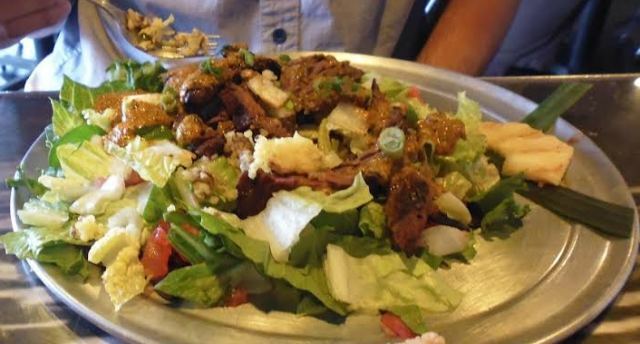 Although I have eaten at Andre’s Cuban Restaurant several times, I could not compare the Embargo with it, primarily because I have not had the same meals at both places. 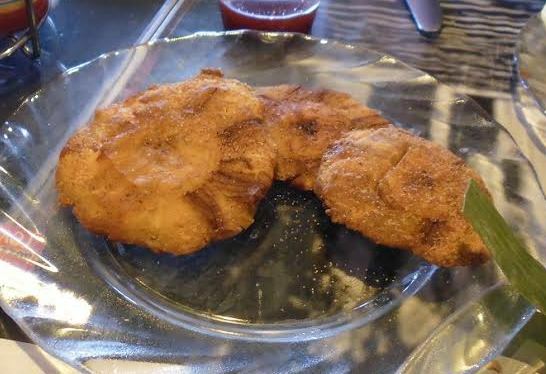 The Platano were crisp, but could not be compared to anything I have had before. There was a hint of sugar but not sweet. I am not sure I would order them again, nor would I order the Tostones again. I had also ordered the Calamares a la Espanola ($4.25) that were buttermilk marinated calamari, served crispy with Citrus Thai Chili Sauce that were served very fresh, very crispy, and the sauce complimented the appetizer. The Churrasco – and the Hurricane, for that matter – were served beautifully. 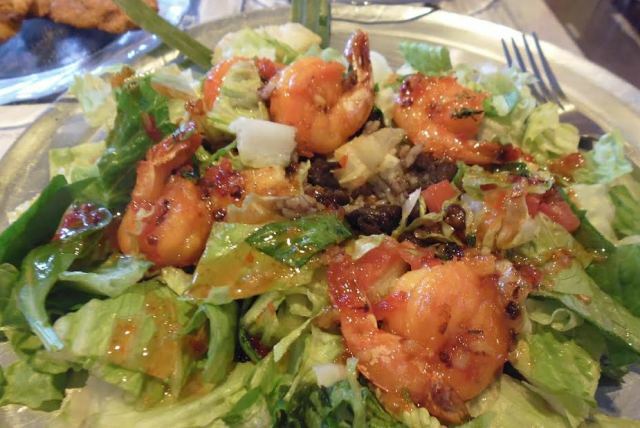 The greens were fresh, crisp, and layered over the rice and beans. 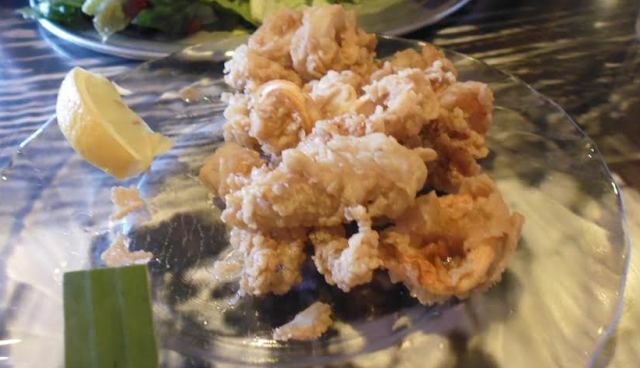 The shrimp were served in the shell, but the tails were easily removed from the body. The flavor was good, and there was a whole lot of both my meal and Jake’s left over. I look forward to trying different entrees at a later date. The two sangria’s tasted very similar but were refreshing. It was too bad it was a cool day, because I would imagine they would have been perfect on a hot afternoon. The service was excellent with both Sarahdawn and Hudi checking on us throughout the meal. At one time Hudi told us to eat the Calamares faster because they were getting cold. The menu consists of Appetizers (Tapas), Salads (Ensaladas), Grilled items such as Portabella, Mahi Mahi, Berenjena (eggplant), and Roasted Pulled Pork. There are two kinds of rice as well as two kinds of beans; and nine different kinds of sauces. There are Combinations, Sandwiches (Plancha), side dishes, Desserts (4) and three different kinds of coffee. I hope that Hudi is successful. The mall doesn’t have the foot traffic it used to have when Long’s was there, but with the proper advertising patrons will go there instead of to the other restaurants in the mall. I still do not understand why music has to be played so loudly; it is a detractor for me in any restaurant, and the Embargo was playing their music loudly; however the food was good, hot, and plentiful and I will try it again. I’ve enjoyed the food both times I’ve gone. My one complaint is that they simply do not give you much meat in your meal. I’ve tried a platter and a sandwich and while extremely tasty, I though the amount of meat on each was lacking. Interested to hear what you think. The sandwich will be the next thing I try. Thanks Judi for the kind words. Thanks for your patronage and for choosing to conduct Jake’s interview at Embargo Grill. Thank you, Hudi, for treating us so well at your restaurant. Jake and I both enjoyed the food and will be back. Tell Sarah-Dawn that I will get her picture next time! I’ve had a coupon sitting on my fridge for a while, been meaning to try Embargo next time Chris and I get out – our last couple restaurant visits have been family meals and Kenzi, while adventurous for a 10-year-old, hasn’t fared well with Caribbean spice. Glad to hear some good words in advance. This is my fave new place to eat and I’ve been there like 10 times in the last couple of months! Sometimes I go a couple of times a week! I love the layered salads with the beans and rice underneath. So many protein toppings and sauces to go on top, it seems endless! And the plaintain chips are super delish. The menu is SO diverse and everything I’ve had has been quite yummy. Owners Hudi and Carl are super friendly and very accommodating. I’ve yet to do my Yelp review, but it’s a coming! Older Article: It’s All About Love, Isn’t It?